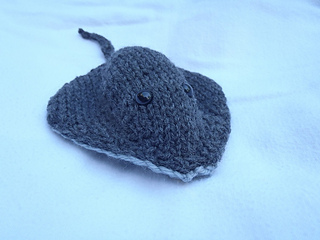 This adorable stingray is knitted in two pieces, then sewn together. 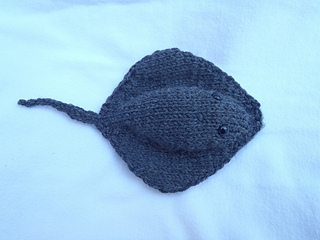 Shaping is done with simple increases and decreases stitches. It is great pattern for someone who is about to try knitting toys for the first time. 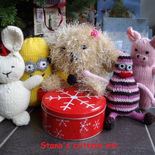 Finished Toy Size: Approximately 5.5” (14 cm) wide, 6” (16 cm) long (10” / 26 cm with tail). About 40 - 50 yards / 36.5 – 46 meters each color. 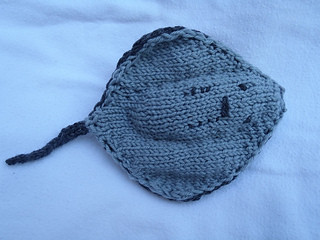 Notions: Yarn needle, scissors, stitch marker, two small safety eyes, polyester fiberfill (small bag).